This theological education is shaped by our commitment to the inspired Word of God and our belief that the Church can, and should, be relevant in today’s society. So if you are considering becoming a pastor, youth worker, missionary or perhaps want to be better equipped to minister in your local church, we have a programme designed for you. "Take the teachings that you heard me proclaim in the presence of many witnesses, and entrust them to reliable people, who will be able to teach others also." The mission of BTC Southern Africa is to offer people called to Christian ministry a biblically based, relevant theological education, which focuses on devotional integrity, practical competence and academic excellence. This theological education is shaped by our commitment to the inspired Word of God and our belief that the Church can, and should, be relevant in current society. In 1951 the Baptist Union of Southern Africa established The Baptist Theological College of Southern Africa. Its goal then was to prepare pastors for Baptist churches. Over the years the college has established itself as one of the premier ministry training institutions in the country. The focus has broadened significantly to include the training of pastors, youth pastors and missionaries. The narrow denominational focus has changed, and the college now welcomes students from all denominational and church backgrounds who are willing to accept our statement of faith. may be completed in a shorter or longer period of time. 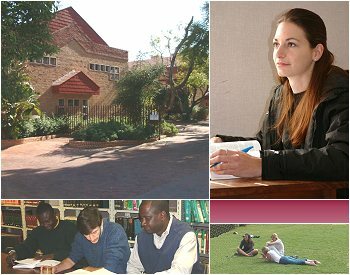 BTC Southern Africa offers both full-time residential studies and correspeondence studies. The College has a dynamic body of students who attend classes at our campus in Randburg, South Africa. While the sacrifices are great, the benefits of a dedicated period of study in preparation for a lifetime of ministry are easy to see. The interaction between learners and staff is impossible to duplicate for distance learners. The College's semesters run parallel to the school terms and lectures are from 08:00 - 13:30 on weekdays. The library is available to students from 07:00 - 16:00 on weekdays. Distance studies have become an integral part of our South African post matriculation educational system. This pattern is particularly true of study programmes for professionals. It means that those who for one or other reason cannot attend College on a full-time basis are not deprived of the opportunity of obtaining tertiary theological education. Distance students receive study notes and tutorial letters, which guide them through the study of prescribed books. Lecturers may be contacted at the College for help and advice. Students should plan to give three to five hours of study per week per course. An average correspondence student completes two or three courses per semester. Students usually have to submit two assignments, on dates set by the lecturer and upon successful completion will write examinations towards the end of the semester. The College offers the students the convenience of e-mail should they wish to make use of this facility. Normal distance studies rely on the postal system to deliver study materials, to send and receive assignments and exams. Students may choose to have study materials e-mailed as well as use e-mail to send and receive assignments. Exams can be sent to an invigilator via e-mail. The only restriction at this point is that ALL distance exams must be written by hand and the script couriered back to the College. Students from countries outside the SADC region must utilise the available e-mail options.